The Bears! The Bears have won! No. 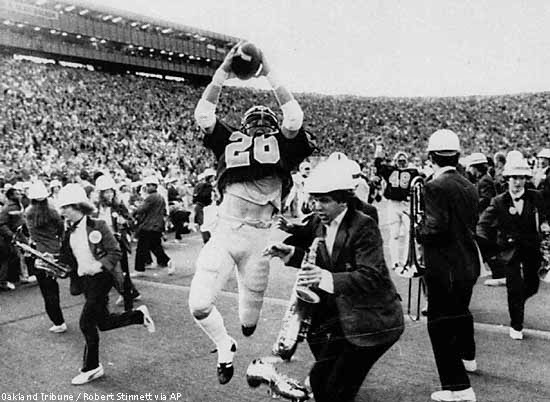 It's not a better finish than Cal-Stanford 1982. 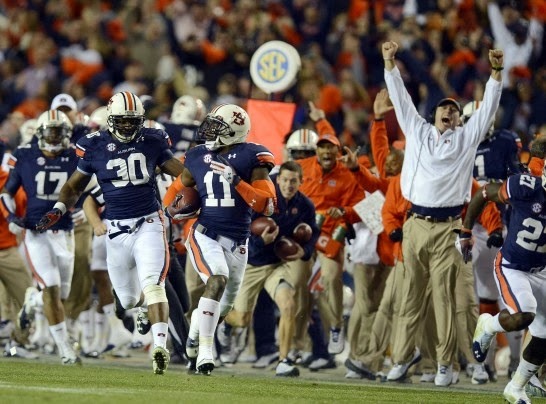 Yes, Auburn-Alabama 2013 is a fantastic college football ending. It featured two top five teams. It knocked the Tide off the perch. It completed a remarkable regular season turnaround for the Tigers. It had national championship implications. And perhaps you only know of The Play based on grainy, standard definition video, and you already knew the ending. While the Auburn-Alabama finish- and by the way, I'm going to call it “The Finish” and let's see if that sticks- was shiny, HD, live, and a Twitter explosion. Auburn's gonna win the football game! And you can like The Finish more than The Play for all of those reasons. That's fine. But the reasoning that makes “greatest” over “great” is beyond all that. Auburn-Alabama finished with a missed field goal for a touchdown. Cal-Stanford finished with two consecutive scoring plays (because Stanford had just kicked a field goal to take the lead), five laterals, and a band on the field. No game will ever again finish like that. Cal-Stanford is untouchable because of the band. That makes it a singular event in the history of college football. Occasionally one person on the sideline will interfere, or at least try to (see Mike Tomlin and his impending fine/suspension for the most recent occurrence... but the 1954 Cotton Bowl sideline tackle is still amazing), but never more than one. In 1982, an entire flipping band came onto the field as the game was still being played. The Play became THE PLAY because of that. The Finish was also not only a play we've seen before, but the possibility of a runback was expected by everybody on both sidelines, in the stadium, and tuning into the game- heck, that's why Chris Davis was nine yards deep in the end zone! Nobody expected Cal to try five laterals. We expect it now because of Cal-Stanford. But in November 1982, practically nobody outside of the Cal team thought about it. And the only reason they thought of it was several Cal players knew some of the Golden Bear rugby players and there had been talk about putting some rugby players on the football team. So they had actually practiced it a couple times. Unofficially, of course, but the guys on kick return still fooled around with it, although very early in the season. Although we don't know the ultimate fallout from The Finish, the quick take is that they both will likely end up in BCS bowls, possibly in the BCS title game. Both teams were guaranteed a successful season regardless of the outcome of the Iron Bowl. 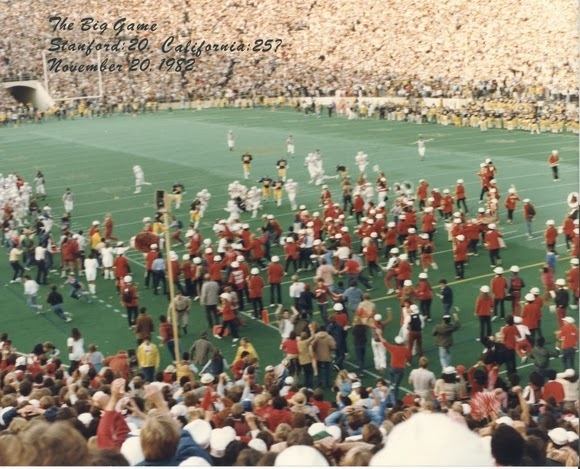 As for Cal-Stanford, the Cardinal were one win away from going to a bowl game- and this was 1982, when there were 15 or so bowls (meaning 30 teams went to the postseason) and not five hundred (meaning everybody but Kansas, Cal, and Purdue goes to the postseason). Hell, Cal went 7-4 because of The Play and didn't get to go to a bowl game. Many people believe the game was between two teams with losing records. Clearly, it was not. 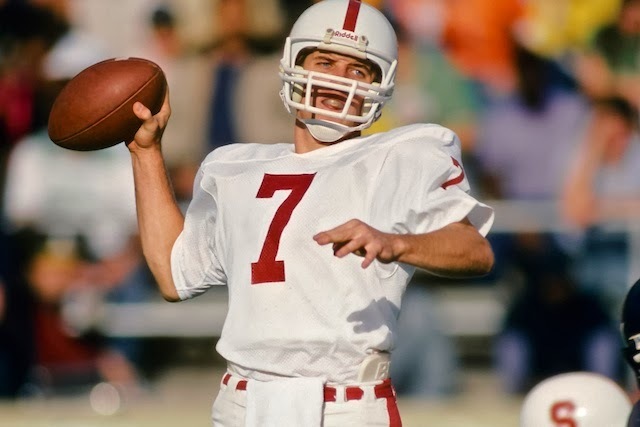 So Stanford finished 5-6, and as a result their starting quarterback never went to a bowl game in college. The loss may have cost him the Heisman trophy the next month (although that's not exactly a given- Herschel Walker won it going away, it may have just been a little closer). But I'd say John Elway did all right despite losing that one game. Never played in a bowl game. As for 2014, it seems highly unlikely that Alabama will go 1-11 and get Nick Saban fired. But that's what happened to Stanford after The Play. Although losing Elway was decidedly a factor in the decline, the Cardinal dazed their way through 1983 at 1-10 and the head coach, Paul Wiggins, points to The Play as a major factor in that record and his subsequent release. (He also says he never should have coached that '83 team.) As for the win? Cal still didn't go to a bowl game for another eight years, so the play didn't exactly spark a revival. And Auburn still has to beat Mizzou this weekend for The Finish to avoid going to a worse bowl than the guys they beat. I want to say that again... 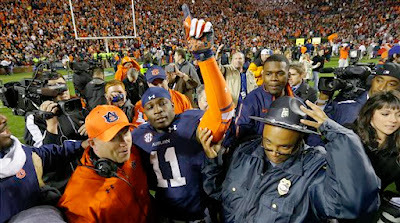 The Finish becomes a footnote- but a great footnote- if Auburn loses again this season. Saturday to Mizzou in the SEC Title Game, the Sugar Bowl, the BCS Title Game, the Orange Bowl... if the Tigers go down it means jack squat outside of the state of Alabama. That's what everyone who's declaring this the greatest finish of all time is forgetting. Auburn-Alabama was a great finish, and the greatest Iron Bowl finish. And bizarrely, it's in the running for greatest college football game ever. I'll grant you that. But Cal-Stanford 1982 is the most amazing, sensational, dramatic, heart-rending, exciting, thrilling finish in the history of college football. Just ask Joe Starkey. The band out on the field makes it number one, because it'll never happen again. Not number one. But it's pretty doggone good.